But when does "no damage history" really mean NO damage history? I have had a couple of recent surprises when a listing said NDH, but a quick search on The Google brought up an NTSB report showing a crash with "substantial" damage. On one of these occasions, I let the owner off the hook after he told me NDH and I found a 1967 crash because nothing about the accident was listed in the logs. Now I'm using a secret weapon that all airplane buyers should know about...the FAA database. 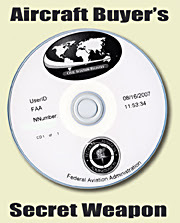 For a crisp ten spot and a few clicks of your mouse, you can go here and order a CD that contains every piece of FAA paperwork ever generated on a particular aircraft. Just plug in the N #, wait about 10 days, and your disk arrives with more 411 then you ever thought was out there about any flying machine ever registered with FAA. The second PDF shows all 337 forms that have been submitted on the plane. You'll quickly scroll through every major repair or alteration, and get a glimpse into the past life of the plane. Want to know what year the ADF was junked...it's in there. That hangar rash suffered back on '72 when Bubba bounced his pick-up truck off the wingtip...it's in there. The good news is that I have found a plane in SoCal that suits my mission profile perfectly. I have ordered the FAA disk, and ought to get it this week. If there are skeletons in the closet of this bird, I'll sleuth them out, since the NTSB search on The Google came up empty. I've set up a meeting with the owner in two weeks to look the plane over and fly it...with fingers crossed. This is the one I want, and so far it has passed every test. I still have several more hoops to jump through including the all-important pre-buy inspection, but at least with the FAA disk as ammunition, I'll go into the negotiations armed and loaded ready for a little back and forth as the owner's broker and I work towards the right price. Stay tuned...this project is starting to heat up. A hangar at EUG has been secured, insurance quote came in low, and the money is collecting interest in the bank, waiting to be sent off to pay for the 235 of my dreams.